Judaism did not have a separate category of mysticism (i.e., the quest for a direct experience of the divine). More of a distinction between exoteric and esotereic expressions of religion. "Kabbalah" is often used as a synonym for "Jewish mysticism" throughout history. This is awkward, since it is not clear that Kabbalah is really mystical. More precisely, Kabbalah refers to a specific doctrine (of the Ten Sefirot) that is first attested in the late medieval era. Other Jewish ideologies were more mystical than Kabbalah, especially the philosophical schools, which strove to elevate the soul towards a pure, contemplative experience of the divine. All Jewish ideologies, including (especially?) Kabbalah and mysticism, are based on the standard orthodox model of observing the commandments. Medieval interpretations of Judaism accept earlier formulations: Bible and Talmudic literature. They claim to provide the authentic, deeper understanding of those traditions. 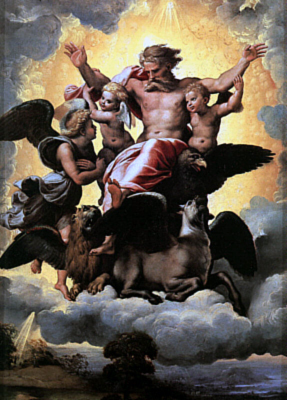 Talmudic references to the Work of the Chariot [Hebrew: Ma'aseh Merkavah]: esoteric practice based on the imagery of Ezekiel 1-2, Isaiah 6: Visions of angels praising God, described as a king enthroned on a chariot made up of angels. The details or content of Chariot mysticism could not be taught openly, so we know virtually nothing about it. Post-Talmudic texts describe mystical ascents through levels of palaces--Hebrew: Heikhalot--to reach the highest--seventh--level that houses the Chariot. Scholars disagree whether these texts reflect the mysticism that was practiced during Talmudic times. Sefer Yetzirah: Describes how God created the universe by combining the ten decimal numbers and the twenty-two letters of the Hebrew alphabet. The term used to designate numbers--Sefirot was adapted by the Kabbalah to designate emanated divine powers. Best-known compendium: The Book of the Pious. Belief in secret mystical tradition conveyed from Babylonia via Italy by the Kalonymos family. Focus on finding meaning in the text of the liturgy: Counting words and letters, numerology, etc. Incorporates traditional Ashkenazic concern with precision in liturgical customs. Meditations on "Holy Cherub," "Glory," intermediary figure analogous to Philonic Logos; apparently influenced by Saadia Gaon. Emphasis on minimizing importance of worldly affairs, in favour of focus on the afterlife. Ideal personality of the Hasid: pious person. Provided strong motive for martyrdom under persecution, especially during the Crusades. First book of "real" Kabbalah; i.e., to employ symbolism of Ten Sefirot as divine attributes (as distinct from Sefer Yetzirah'). Keneset Israel (midrashic personification of the Jewish people) is equated with the Sheikhinah, the Divine Presence, though in rabbinic tradition they were two distinct concepts. Sefer Ha-Bahir is unstructured and apparently incomplete, though it appears to have been so since its first appearance. Author and origin unknown. It appeared in Provence in the late12th century. It seems to have been composed shortly before that. Portions appear to have been compiled by the German Pietists, who appear to have made use of "Oriental" sources, notably the "Raza Rabba." Composed (principally, at least) by Rabbi Moses de Leon of Guadalajara, Spain, around 1280-86. The Zohar may have been the work of a "school" of kabbalists, incorporating heterogeneous traditions. Claims to be midrash from Talmudic era, to Pentateuch, Song of Songs, Ruth and Lamentations. Claimed to be copied from ancient manuscript in his possession. Adoption of Aramaic dialect of Targums (ancient Biblical translations), rather than more familiar dialect of the Babylonian Talmud. Narrative structure: School of mystics led by Rabbi Simeon ben Yohai wander about Gallilean countryside exchanging secret interpretations. "Exotic" characters; e.g., "Yanuka" the child prodigy. 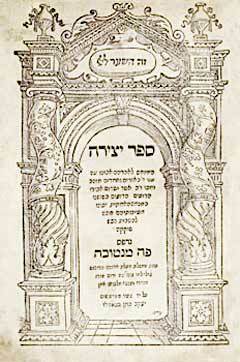 "Zoharic Literature"-- Later works presented as sections of the Zohar and incorporated into most editions of the Zohar : Ra'ayah Meheimana and >Tiqqunim present radical (by the same unidentified author) present a radical positions that challenges the legitimacy of non-Kabbalistic streams of Judaism. God is ultimately unknowable to humans. The Ein Sof (Infinite) is rarely discussed in Kabbalistic texts. God reveals himself to the world through ten Sefirot, representing different attributes ascribed to him in traditional iterature. When read according to the esoteric Kabbalistic hermeneutic, the Bible and other sacred texts can be seen as referring to the interactions between the Sefirot. Differing names of God allude to different Sefirot. Biblical personalities embody different Sefirot (e.g. : Solomon = Wisdom; Leah = Understanding; Abraham = Lovingkindness; Isaac = Judgment). The Sefirot are the instruments through which God created the universe. Humans can influence the upper realms through their behaviour, depending on whether or not they observe the commandments in the proper way. Righteous actions allow the uninterrupted flow of divine goodness into our world. Sin produces obstructions to that flow. The harmony in the celestial realms is ultimately dependent on human action. Humans can affect God! Reinterpretation of classic tension between God's "Standard of Justice" and "Standard of Mercy." Justice equated with the left, female side of the Sefirot: The destructive poser of God, associated with separation and disharmony, stopping the flow of blessings into our world. Mercy equated with right, male side of the Sefirot, allowing the harmonious flow of goodness. Recognition that a balance between extremes of mercy and justice (represented by "middle column," the Sefirah of Tif'eret) is the ideal. Reinterpretation of Rabbinic concept of the Shekhinah, the divine presence in the world. Equated with the tenth Sefirah and with the community of Israel. Romantic metaphor: Shekhinah is beautiful princess, the upper Sefirot portrayed as King. The situation of Exile portrayed as separation between the lovers. Correlation between historical exile of Israel and a dissonance in the metaphysical realm. Eschatological implications: Redemption of Israel is bound in with the restoration of divine unity. This contributed to the proliferation of Kabbalah-based messianic movements, such as that of Shabbetai Zvi. To read about the ten sefirot of the Kabbalah and their symbolism click here. 1648--Cossack massacres led by Bogdan Chmielnicki murdered about half the Jewish population of Ukraine and Poland. Class divisions: Jewish communal leadership unresponsive to needs of poor. Traditional Talmudic religion provided insufficient consolation or inspiration for masses in times of crisis. Legend describes him as a "hidden" mystic unappreciated by his neighbours. Recent evidence indidates he was a respected figure in his community. As he practiced his healing craft he also began to preach his religious teachings. c. 1736--Hasidic legend speaks of the Besht publicly revealing his mission at the age of 36. Spread his teachings effectively by means of simple stories and parables that appealed to the uneducated Jewish masses. Overwhelming consciousness of God's Immanence, even in outwardly simple objects and actions. Appreciation of God in nature. The experience of the Divine is thus accessible to all. Joy at consciousness of a loving, ever-present Creator. Appropriate mood for worship is happiness; suffering impedes a proper relationship with God. Effective antidote to the demoralization of Polish and Russian Jewry. Encouraged singing, dancing, story-telling, drinking, etc. "Restoration" of songs and stories as mystical and spiritual acts. Click here to listen to an example of Hasidic singing. Devekus ("clinging"; constant devotion): The unceasing consciousness of God's presence. Hislahavus ("bursting into flame"; ecstatic enthusiasm): The experience of spiritual exultation as the soul is elevated towards God. Celebrated sincere devotion over mechanical recitation of the liturgy. Participation of all limbs and forms of expression in worship: through gesticulation, dance, song, etc. Messianism and Eschatology: Scholarly disagreement about the importance of Messianic aspirations in the doctrines of the Ba'al Shem Tov. G. Scholem: He intentionally tried to neutralize the eschatological themes, reinterpreting them as processes that take place internally spiritual processes. Ideal of indiscriminate solidarity and love for all fellow Jews.